As the year comes to an end and everyone is celebrating New Years, horology fanatics are getting ready for their New Year’s of sorts, the SIHH show in Geneva. Like a kid waiting for that faithful Christmas morning to open up all the nice goodies under the tree, many of us are waiting to see what our favorite watch companies come up with for the upcoming year. Some children will be overwhelmed with joy and jubilation, some will be left wanting more, and some will just be disappointed after being “good” for Santa the whole year. Looking back at this years SIHH, I guess I am caught somewhere in the middle. Being that I am on the West Coast, I had to stay up pretty late to keep up with all the happenings in Geneva. Was it worth it? I like to think so just for the sake of being a fan of horology, but I wasn’t blow away by any means. 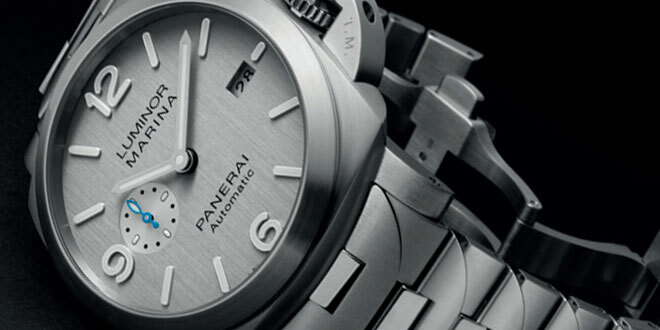 This post is going to just be one Panerai fans take on the 2014 model lineup presented. I would love to hear your comments as well, just use the comment section at the bottom. I have been a fan of the brand for a very long time and have loved how they combine simplicity with function on almost all their watches. 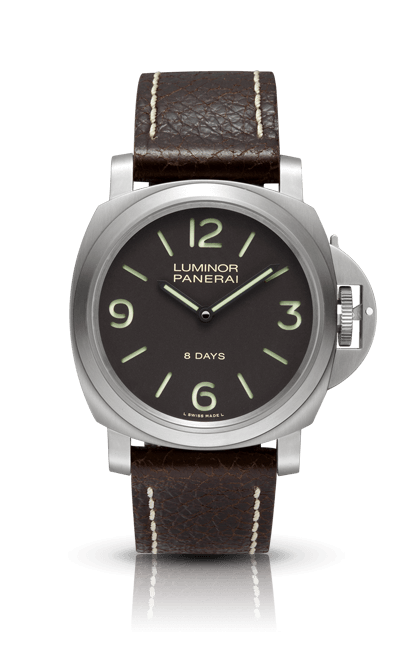 Sometimes less is more and in the case of Panerai I have always believed that. Don’t get me wrong, I do enjoy some of their more complicated pieces, but I tend to stick to some of the classics. 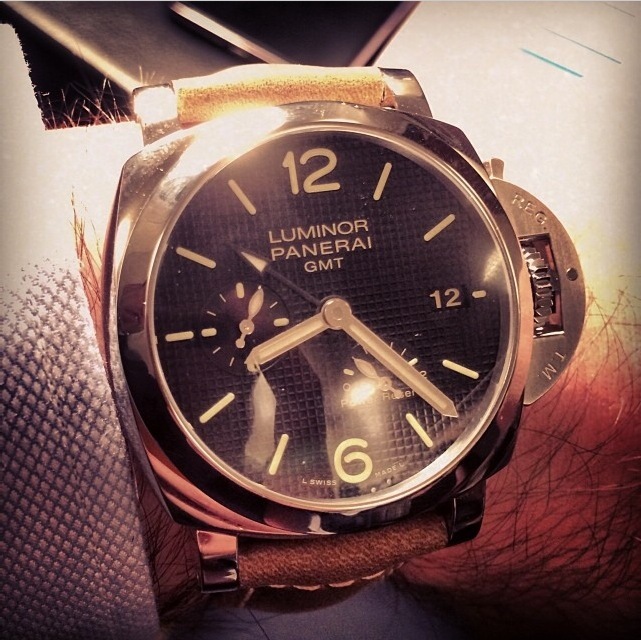 Lets get this “Christmas” going with the first major offering that Panerai pushed at this years SIHH 2014. 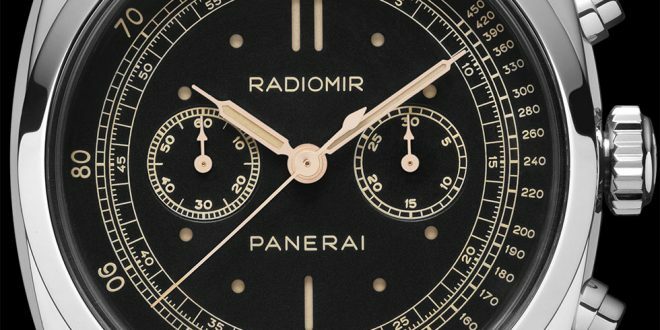 Panerai gave us a bit of a Sneak Peak at to what their focus was by placing a video on their site hinting at the 1940’s case Radiomir combined with the chronograph complications. 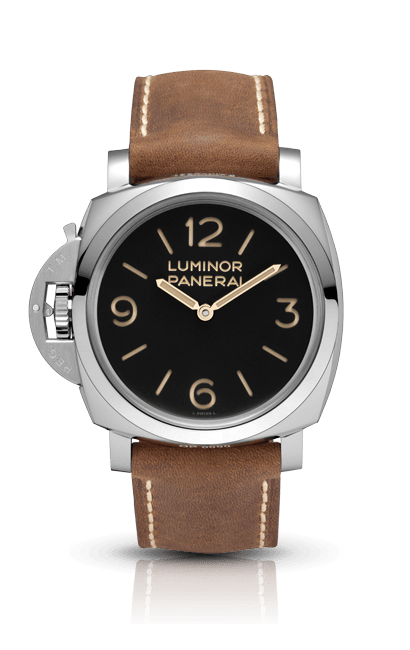 Fast forward to Geneva a few days ago, Panerai releases the PAM518, PAM519, and PAM520. Each is made out of a different case material (Platinum, Rose Gold, and White Gold) and all feature the Minevra Based OPXXV movement. 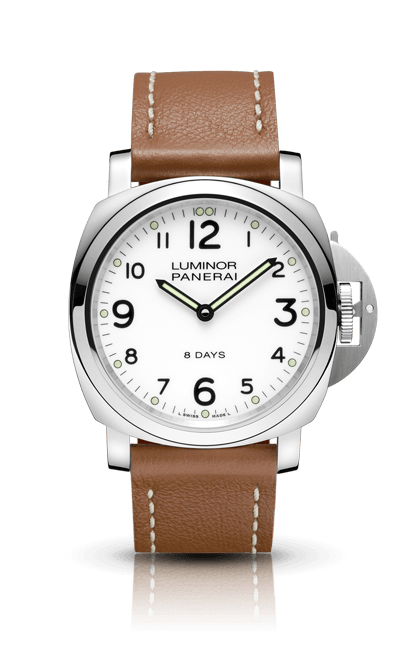 The PAM518 and PAM520 both feature a play on the SLC dial while the PAM519 uses a California Dial. 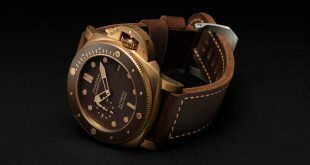 At first I was drawn the design of these Special Edition Radiomirs even though they were not the typical Panerai style. But after a few hours of staring I started to find myself falling out of love with them because they just didn’t do it for me. 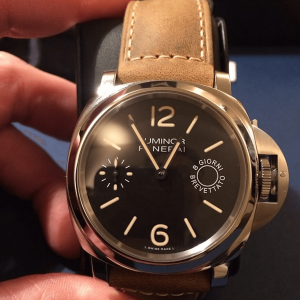 They just don’t fit the Panerai mold in my opinion featuring dials that are just a bit too busy for my liking. The more and more I stared at them the more I realized these models reminded me of something, so I started going on the hunt and I finally found it like a long-lost friend. 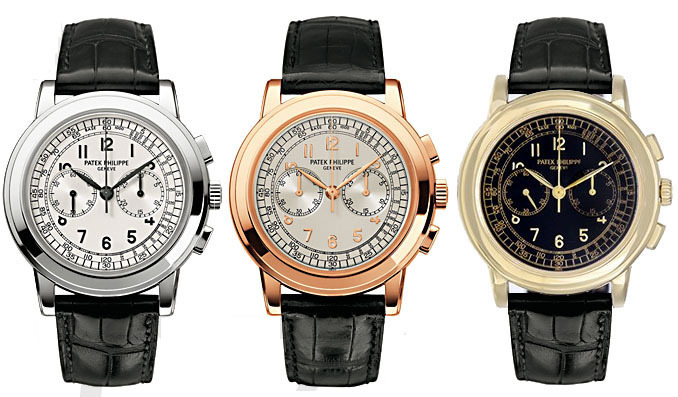 These Radiomirs very closely resemble the Patek Phillipe 5070 model chronographs. I understand there are a lot of differences in the two pieces like the case shape and base dial, but you can’t argue the fact that they come from the same DNA. If anything these two models are step brothers in the horology family. 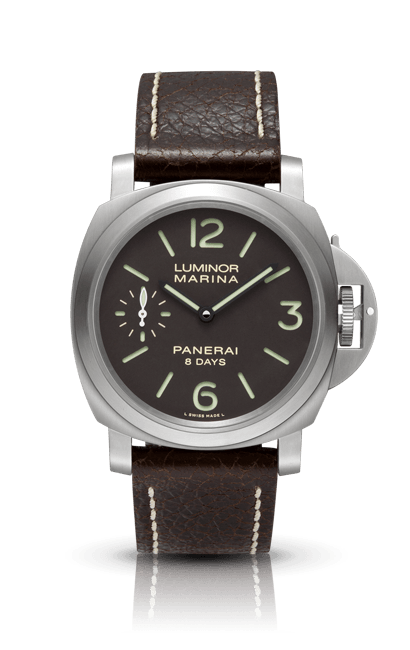 I understand that these models are outside the box in terms of Panerai design, but they aren’t anything out of the norm in my opinion. 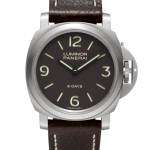 There were rumblings going into SIHH that Panerai was looking to slowly phase out the ETA movement on a lot of their base models. 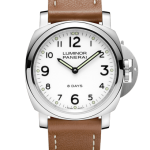 Maybe enthusiasts were worried that they would phase out the base models entirely, but that rumor was put to rest when the new Luminor Base models were presented at SIHH 2014. 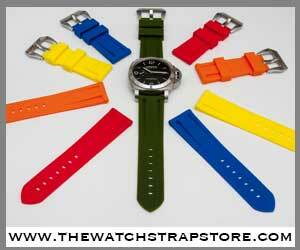 Taking the place in these base models with the ETA movement is the newer 8 Day P.5000 in-house Panerai movement. The offerings will feature 3 Luminor Base models in Steel and Titanium and also feature a white dial. There is also 2 Luminor Marina models with the small seconds hand in Steel and Titanium. There really isn’t anything new an exciting in regards to these models and the only real difference you will notice from their predecessors is the 8 Day distinction on the dial. SIHH 2014 in someways was the year of the “Left Handers”. 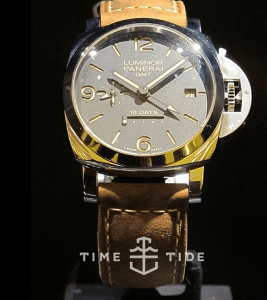 Panerai officially released two new left-handed as well as one unofficial one you will hear about later in this post. 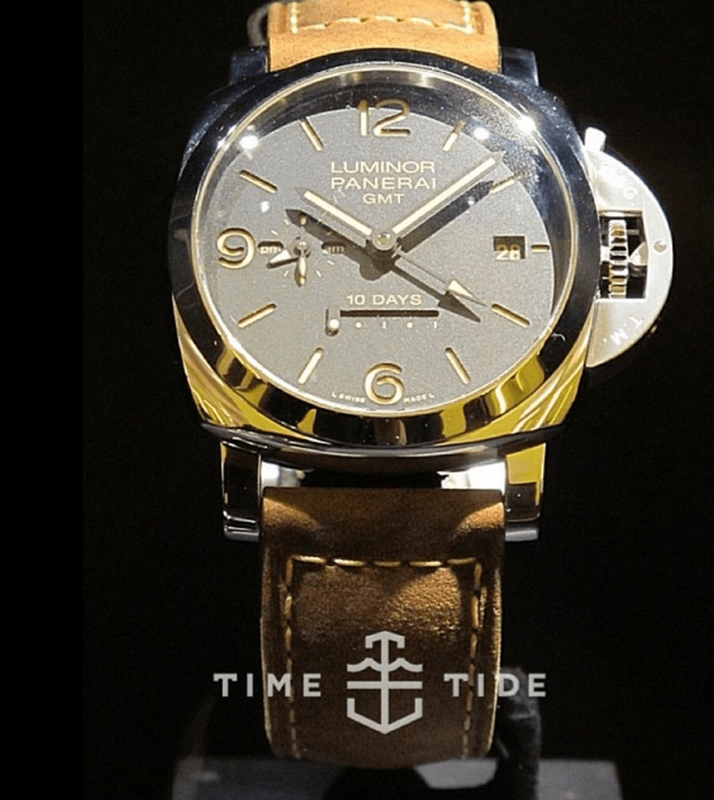 With the popularity and demand of the PAM372 from last year, Panerai decided to unveil its counterpart the PAM557. Nothing new at all with this piece to talk about. 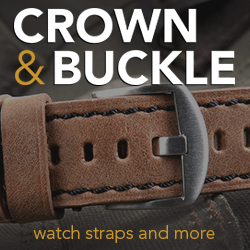 Just take the crown guard, move it to the left side and you have the PAM557. 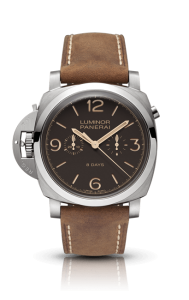 The second model that was introduced with that PAM579 left-handed 8 Day Chrono Monopulsante. Personally I believe this is the best piece of the show so far. The only unfortunate thing for me is the fact that it was made for a lefty. Maybe they are doing it in reverse this year? Bring out the left-handed model and make everyone die with envy and hope for the regular version to come out later. 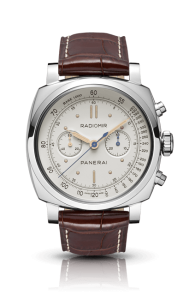 This chronograph, unlike it’s Radiomir counterparts, manages to include the chronograph features without losing too much of the Panerai DNA. 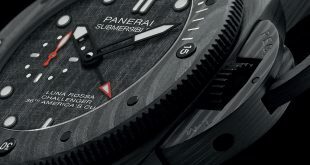 As with every SIHH show there are other model releases that are not part of the official SIHH lineup. These are usually put on display later on and aren’t always released. This year there have been a few pictures leaked on Instagram of the different models that could be coming out. The information I am providing is based on people at the show and are subject to change because they haven’t been fully released. Included int these are 2 new GMT models that we don’t have reference numbers for yet. 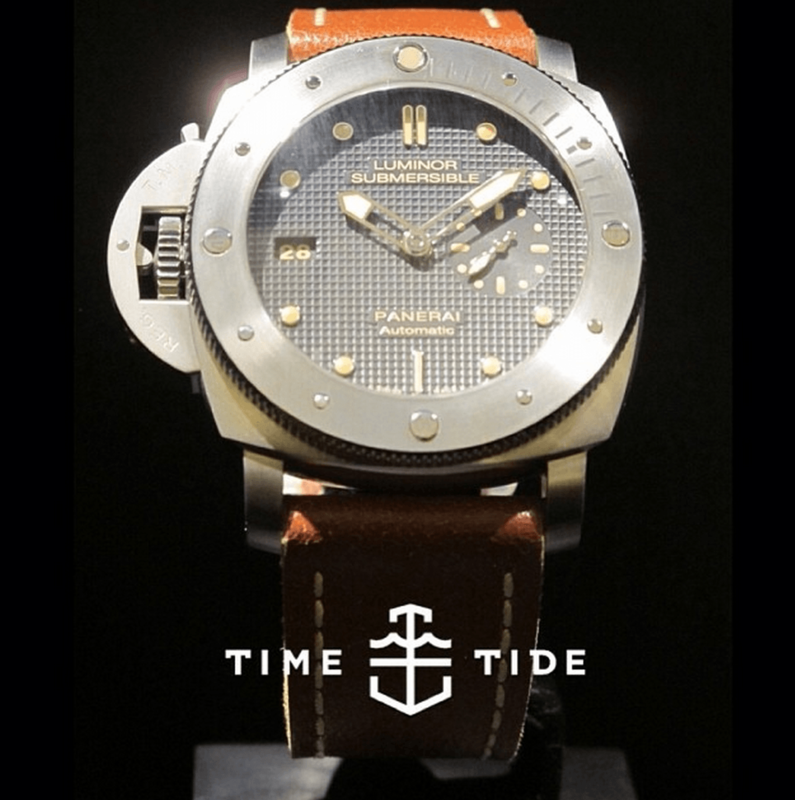 They both are 42mm, 8 day mechanical wind movement, and feature a hobnail dial. 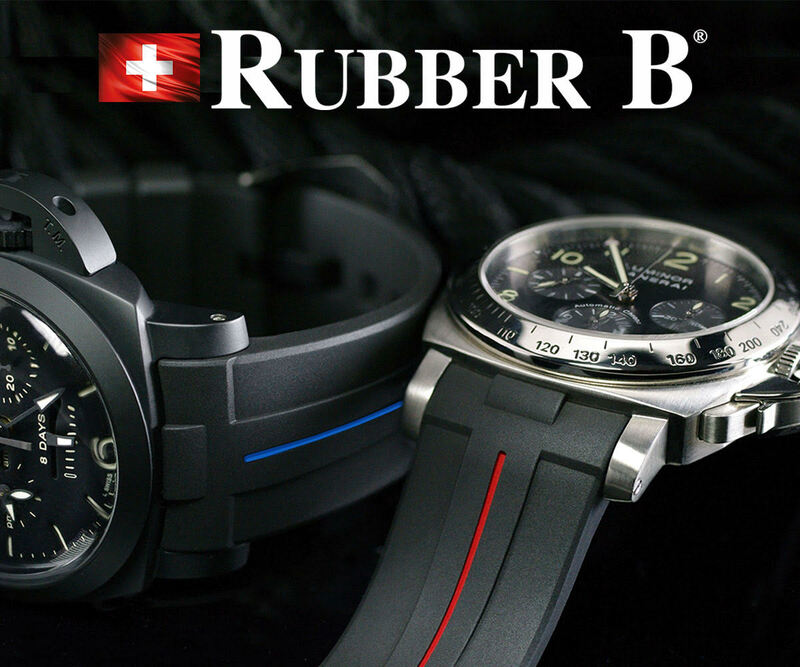 One of the models features the power reserve indicator on the dial while the other does not. I don’t see anything special with these dials except for the new dial type. I still don’t get the GMT function with no AM/PM indicator or 24 hour markers. 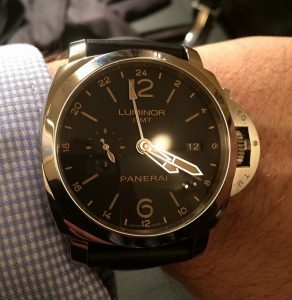 These GMT in reality are just a Panerai with a second hour hand at the end of the day. Once again it looks like they just dumbed down a different model and added a few minor variations. 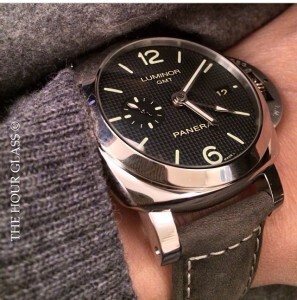 Later in the show another true GMT surfaced which is being marked as the PAM531 GMT 24 Hour Automatic 44mm. 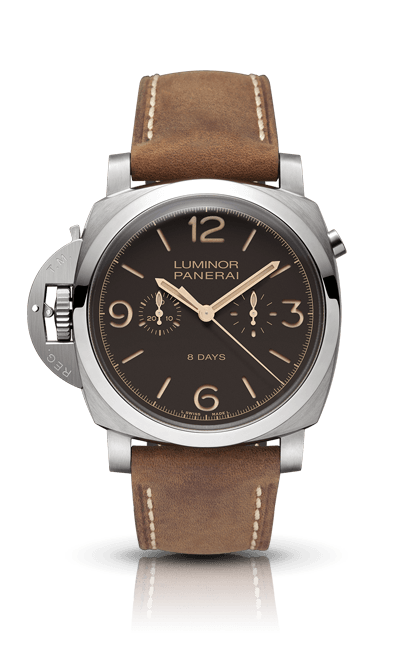 This one reminds me a lot of the PAM63 so not too much going on here that is revolutionary. 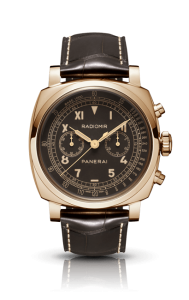 Anyone catching on to the repeating theme of this years SIHH? Yup you guessed, another model that is just a play on a model before it. Great creativity guys! Seriously! 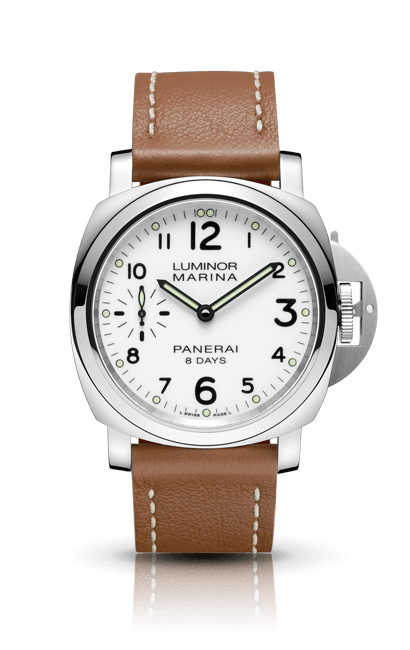 One other piece, the PAM590 8 Giorni Brevettato gets my stamp of approval as well. 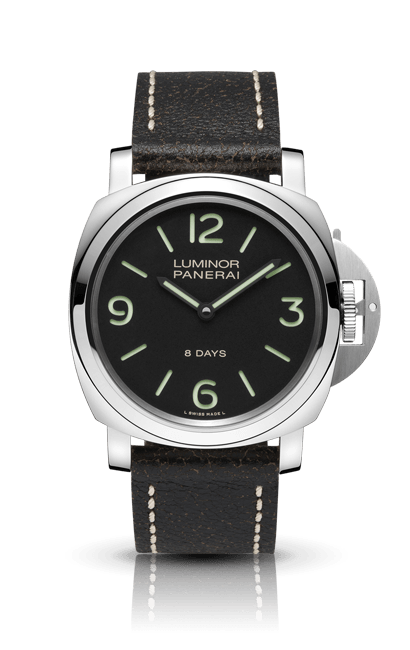 Even thought it’s very closely related in DNA to the PAM203, it is one of only 2 models that I truly am happy about during this exhibition. This model features a 44mm case and is adorned with one of the most iconic insignias to be placed on a Panerai Dial (the circle featuring the 8 Giorni Brevettato). 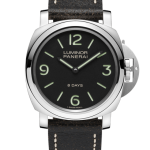 This model also features the ecru colored painted dial as opposed to the more common green luminor sandwich dial. It does look a bit weird not having either the 3 or the 9 on the dial but I guess that is the only way they could have fit both the small seconds hand and the logo while bringing the case size down to a 44mm from the 47 in the original 203. The only thing I hope they change before it’s released is to add gold hands to it. I think that would just about complete this beauty. 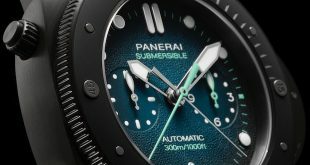 Two other models that were shown is the PAM569 which is the first ever left-handed submersible featuring the hobnail dial, Titanium case and ecru colored numbers instead of the customary green luminous pieces. 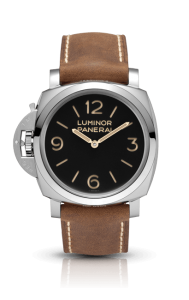 As mentioned before this year was really kind to the left-handers; makes me wonder if someone in the higher-ups of Panerai is left-handed and felt a little slighted by the lack of choices offered to him or her. The other one is a pretty plain-looking PAM533 GMT 10 Days in a steel case. As I mentioned in the beginning of the post, I am left a bit underwhelmed with the lineup that was presented at this years SIHH. I understand that you can’t please everyone when it comes to these things. There are going to be people who undeniably will be on the other end of the spectrum in their opinions of the collections and they are entitled to that. That’s what makes things interesting at the end of the day. The thing that disappointed me the most is that I truly felt that there wasn’t truly a lot of effort put into the new designs. 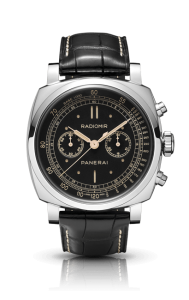 From the 1940’s Radimir Chrono’s to the 8 Gironi Brevettato you will notice a common theme, they took other designs and tweaked them a bit to make it “NEW”. 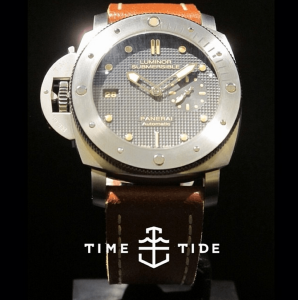 I am not a watch designer by any means and I know they want to try to stick to their roots but lets not pass off minor variations of previous models that were well received. At the end of it all they are in the business to sell watches and undoubtedly they will sell these pieces because they are all new and shiny, but I’m hoping there are some other pieces that will show up throughout the year that will challenge the way we think about this years SIHH and prove me wrong. I would love to hear your thoughts so please leave a comment below.